This event was on Day 8 of the 12 Days of the Heart of the City Festival. Please check the website for more events! Culturally specific events bring a sense of belonging and camaraderie to an otherwise isolated and disenfranchised Aboriginal population. Carnegie’s weekly Cultural Sharing Program, now in its twenty-fourth year, offers First Nations people from across North America an opportunity to share cultural events such as Pow Wows, cultural trips, singing and drumming, and to make arts & crafts. For the Festival this year we have a special Aboriginal celebration with dancers, singers and drummers from the Coast Salish Territory and the Nisga’a tradition. You will need a ticket for the Feast, see below for information. We’ll gather in the theatre on Carnegie’s main floor where Sam George will do the territorial welcome. The Carnegie kitchen is planning a wonderful menu for a special feast to share. During the feast, Dalannah Gail Bowen will sing a few songs and Darcy Demas and Ocean Side Dakota will follow with drumming. You will need a ticket for the dinner. Tickets are available on a first come first serve basis at the Cultural Sharing group on the afternoon of Monday October 22. On the day of the Feast you can pick up a ticket from the Carnegie 3rd floor program office (only available on Mon Oct 29). Any remaining tickets after 4:30pm will be available at the door of the Theatre, again on a first come first serve basis. 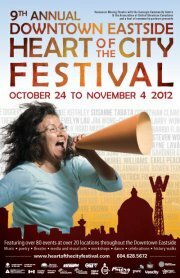 This event was on Day 6 of the 12 Days of the Heart of the City Festival. Please check the website for more events!